Bought three smallish pocket knives to test and then send at least one back to Amazon. My mini Swiss Army Knife is generally useful and I love it but I’m always apprehensive I’ll cut myself with the non-locking blade when I’m opening boxes and such. I have a Buck knife given to me by a former employer and it’s a great tool but it’s too large to carry all the time and I really wanted something I could open and close with one hand. I got knives from Gerber, Spyderco, and Kershaw. 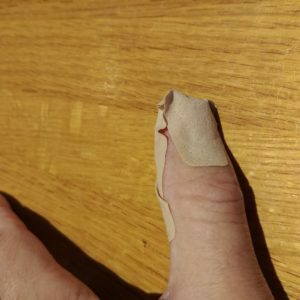 I also now have a bunch of small but annoying cuts on my fingers from practicing the one-handed open and close operation all these knives promise. The comedic value of the fact that I got these thing to avoid cutting myself is not lost. The Kershaw’s probably going back. I like the design and its one-handed operation is nice but it feels like it weighs twice what the other two do — also it just feels much bulkier. Don’t want all that mass in my pocket all the time. The Gerber is probably the most practical and is a keeper. An easy decision because it was the cheapest of the three. The Spyderco is easiest to open and hardest to close one-handed — the source of most of my cuts, actually — but it’s a really cool design and a delight to hold, so in addition to being clumsy and dumb, I’m also shallow, impressed by shiny baubles.